If you are tired of using chemically-treated shampoo and want to restore the health of your dull, dry, and damaged hair right now, it is time to go back to our Mother Nature and opt for a natural hair washing ingredient. Reetha can be the best choice for making your hair clean, soft, and shiny once again just by washing it in a regular manner. If you are new to the concept and want to know how to wash hair with reetha, go through this article and explore two simple and effective methods that can be tried at home easily. What Is Reetha Or Soapnut? Reetha or soapnut, (scientifically called Sapindus Mukorossi) is a common Ayurvedic medicinal herb. It is basically a tiny, spherical nut (similar to the walnut) that is available in almost any store selling Indian herbs and medicinal plants. The herb contains ‘saponins’ (a class of chemical compounds that makes foam when shaken with water), which hold the abilities to ‘clean and wash’. Therefore, when comes in contact with water, reetha creates mild soap-like suds. This makes the herb a versatile one. How To Wash Hair With Reetha? Take a few reetha nuts and some pieces of shikakai in a bowl. Add some boiling water to that and allow the ingredients to soak overnight. Next morning, cover the bowl with a tight lid and shake the whole thing well until you see the liquid frothing up a bit. This is when your shampoo is ready to use. Strain the liquid out but do not throw away the used soapnuts and shikakai. Rather, take another jar of water and place them inside it for future use. Divide the strained liquid mixture into three equal parts. Start massaging your scalp with the first part and work it through the entire length and volume of your hair. You will notice that it does not give much lather. Wash it off completely with plain water. Repeat the process with the second part of the shampoo and again, not much lather will be visible. Again, wash it off with plain water. Now, use the third part of the shampoo and this time you will notice slight lather. Wash the lather as well as the shampoo off with plain water. Finally, pour the water kept inside the jar along with the used soapnuts and shikakai onto the end of your hair and allow it to soak for about 2-3 minutes. Then, wash it off thoroughly with plain water. You will notice slight lather during you third wash and this is an indication that the hair has been cleansed completely. You will also feel that the hair is getting a little tangled. But there is no need to worry as both reetha and shikakai are natural conditioners, which will turn your hair softer and smoother instead of creating dryness in it. Grind a handful of dried reetha nuts into a fine powder. 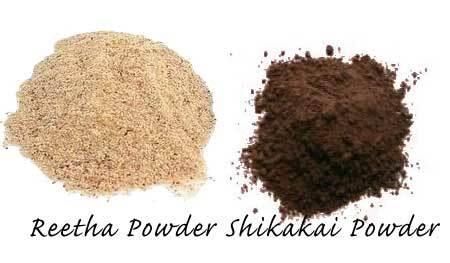 Also, grind a handful of dried shikakai pieces into a smooth powder. Mix both of these ground ingredients together in order to prepare a herbal mixture of hair rinse. Add some water to this mixture and make an even paste of medium consistency. Now, it is ready to use. Apply the herbal paste to your scalp in a uniform manner and slowly work your way to the end of your hair. Massage for 2-3 minutes by moving your fingertips in a small circular motion. Then, add water and rinse thoroughly. Make sure that the paste is washed off completely. You may want to repeat the rinsing process until the water dripping off your hair is completely transparent. That is when you become sure that the powder has been washed off completely. Even if a little bit remains in your hair, it will just fall off when your hair will be dry. This is a convenient method as you can make a jarful of the rinse mixture and use it for over a month. Also, the ingredients are readily available in the market in powdered forms. You can even add a little hibiscus powder to your mixture for better results. When you wash your hair using reetha, it becomes a lot more tangle-free in comparison with the results you get by using a chemically-treated shampoo. Since reetha is a very mild ingredient, the natural oils of the hair remain intact, giving it a better shine and texture after each wash.
After using reetha, the hair becomes very manageable as it gets completely free from frizziness and split ends. 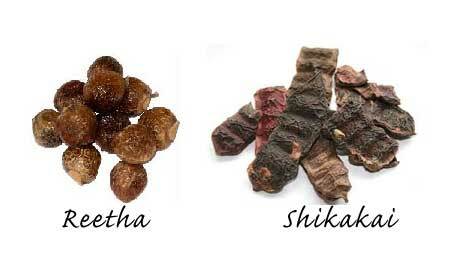 With regular use, reetha makes the hair stronger from the root, which reduces hair fall significantly. Reetha makes the scalp feel more moisturized and helps it stay supple. Finally, reetha is a great conditioner that also nourishes the hair to help it grow faster.